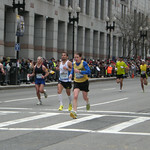 My first Boston Marathon was just as I had expected… I was there as a spectator. Among other things, I discovered that my camera’s battery is going south, I am still unable to dress for the unpredictable Boston weather, and I need a new digital camera with a better pixel-count. 80 degrees and sunshine? Sounds just like home! 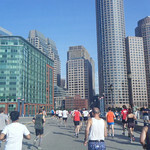 Dublin in Boston, Running in Quincy.